888sport offer 10/1 Denmark or 50/1 Rep. Of Ireland to win the 1st leg match! Denmark and Rep. Of Ireland lock horns in Copenhagen in the first leg of the 2018 World Cup play-offs. Are you placing a bet on this match? 888sport are offering a price boost on either side - claim 10/1 Denmark to win or 50/1 Rep. Of Ireland to beat the Denmark! Max bet £5! Denmark conceded only eight goals during their qualifying campaign and are unbeaten in their last ten matches in all competitions, a sequence of results that includes a fantastic 4-0 thumping of Group E winners Poland. Ireland were unbeaten in their five World Cup qualifiers away from home, also winning in Austria and Moldova and collecting 11 points from a possible 15. 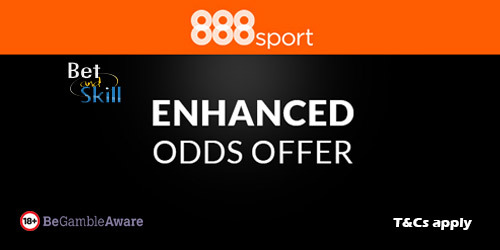 Join 888sport and choose your price boost - 10/1 Denmark or 50/1 Rep. Of Ireland to claim the bragging rights! "888sport offer 10/1 Denmark or 50/1 Rep. Of Ireland to win the 1st leg match! "